Hi people, if you looked in the main A8 chat.. you would see I am getting my original Nick Kennedy designed 232 chip sio going. I can run in DOS (boot from USB ) sio421 - the last dos based software from him. But when I load RespeQt.. it says it canot load the Rs232 driver.. defaulting to USB. Is this the two chip design for SIO2PC? I didn't think any software but Nick's own SIO2PC for DOS worked with those. Maybe APE for DOS also had the option. Too long ago to remember for sure. No, this is a one chip design. I use this daily, it works with everything I have except the RespeQT software. TheMontezuma, did we get anywhere with my handshaking issue?? OK, SO I did go out and buy APE.. I use that the prosystem with my PC21050 device.. It has been a great item. I am now looking at your other work PCLINK.. I would like to get this working.. SO.. I need RespeQt to get it going I assume? Edited by Bikerbob, Fri Jul 22, 2016 2:50 PM. You can use the "NONE" handshake with your "special" SIO2PC cable. RespeQt (it is not included in r3, you need to get current software from Github) or sio2bsd (linux command line tool from drac030). RespeQt for Windows has at the moment a PCLINK issue with reserved file/directory names (like COM1). Ok tried RespeQt again this morning.. r3 is the last one I had.. but it had software sio2bt in the options for the handshaking. THAT worked.. sort of.. I would get burst of communication.. LONG PAUSE.. then burst again. but not at fast sio speeds.. no RI CTS and NONE did not work. Back to APE.. no issues.. This is EXACTLY what I have made - I went over the circuit the last time I posted to this topic.. there is nothing different. Aspeqt and APE work without issue on my cable. 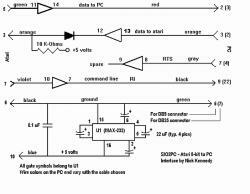 As per the schematic I use RI handshaking on both other software. But that being said.. I would not expect changes for one persons issues..
Edited by Bikerbob, Sat Jul 23, 2016 7:53 AM. Interesting. This matter intrigued me enough to go and dig my own home-made MAX232 SIO2PC out of the drawer and test it (also using RI handshake) with the latest build of RespeQt. It works. As far as I can tell, it uses an identical design. Note that I have the PC serial end of the device hooked up to a CH340 USB serial adapter (this PC lacking a serial port), although wouldn't expect behaviour to be different using a physical serial port. I haven't used this combo for years since I moved to USB FTDI adapters built into SIO plugs, but anyway - it still works. The RI command line does not have a diode or a resistor or a cap on it.. IF the RI works on one system then it should work on any... am I wrong?? there is no condition except open or closed?? I will soon, get my multimeter out and measure the caps, and resistors.. make sure everything is correct.. maybe I am out of range on something? Edited by Bikerbob, Sat Jul 23, 2016 3:03 PM. Could you try re-wiring your interface so that it uses CTS instead of RI and test if this works (don't forget to change the command line in the RespeQt settings)? On 16550 serial ports the RI line triggers only an interrupt/event on the trailing edge (i.e. at the end of the command frame), CTS and DSR trigger interrupts on both edges. From a first glance it looks like the code could need the event on the leading edge (beginning of a command frame) which will never happen with RI on a "real" serial card (USB-serial adapters are different). You are using windows, right? I suppose in that case, we would have to poll like we do in linux, at least for RI. Maybe make a 'force /CMD polling' option for windows? Ok I am not super versed, but I know 16550 are true serial ports correct? aka the one I have on my T40 laptop. SO.. if Hias line is to be seen as correct.. this would make the difference as to why yours works Flash and mine does not.. because you are not dealing with a true serial port. Now with that old circuit, how would I change it to work with CTS? are we simply re-routing a jumper or two? Or I have an FTDI.. I could simply build an SIO2USB which should get us around this issue I alone seem to be having.. and it would also allow me to use PCLINK.. because the virtural Serial port will not be com1.. which is the issue correct? And not that this is an APE thread.. but does APE allow reading and writing to a mirrored pc directory? or does PCLINK provide a unique advantage? Edited by Bikerbob, Sun Jul 24, 2016 12:09 AM. Now with that old circuit, how would I change it to work with CTS? are we simply re-routing a jumper or two? You just need to change 1 wire on the RS232 connector. Desolder it from the RI pin and solder it onto the CTS pin. If you are using a 9-pin RS232 connector RI is on pin 9 and CTS on pin 8. If you have a (full size) 25-pin RS232 connector RI is on pin 22 and CTS on pin 5. In the latter case and if you are using a 25-pin to 9-pin adapter there could be another issue: I've seen adapters that didn't connect all signals. If you are using such a thing check with your multimeter that the RI signal is actually wired up. Edit: even if you use an adapter I'm quite sure that it's OK, otherwise r2 wouldn't work. Edited by HiassofT, Sun Jul 24, 2016 3:57 AM. The commit which you mentioned is actually a bugfix for Windows (Linux version worked OK). Before my commit, the code was waiting in point 1) for any change (rising or falling edge of the command line). I checked the corrected version with my Laptop with a real serial port and a SIO2PC cable using CTS (http://atariki.krap....ndex.php/SIO2PC). Now it all makes sense, considering what you said about RI signal. Such cable would never work with RespeQt under Linux, where we explicitly wait for a rising edge. No, polling will work for the RI line, but windows event trapping will not. RI can be read at any time, but it only produces interrupts on the edge we don't care about, that is the issue. That all said, I have had machines that don't work with RI at all for whatever reason. Regardless of RespeQt/AspeQt version. You are right, I forgot that Linux implementation uses polling. OK, so .. long and short of all this.. SIO2pc using CTS is the way to go? Correct? I take my max232 pin 7 and change the jumper from pin 9 to pin 8 on the rs232.. and I am now using CTS. And CTS will not be an issue for APE.. or AspeQt.. etc.. because they all have the ability to use devices that use CTS? -- Do most modern SIO2.. whatever devices use CTS.. or more important NOT RI??? Edited by Bikerbob, Sun Jul 24, 2016 11:28 AM. 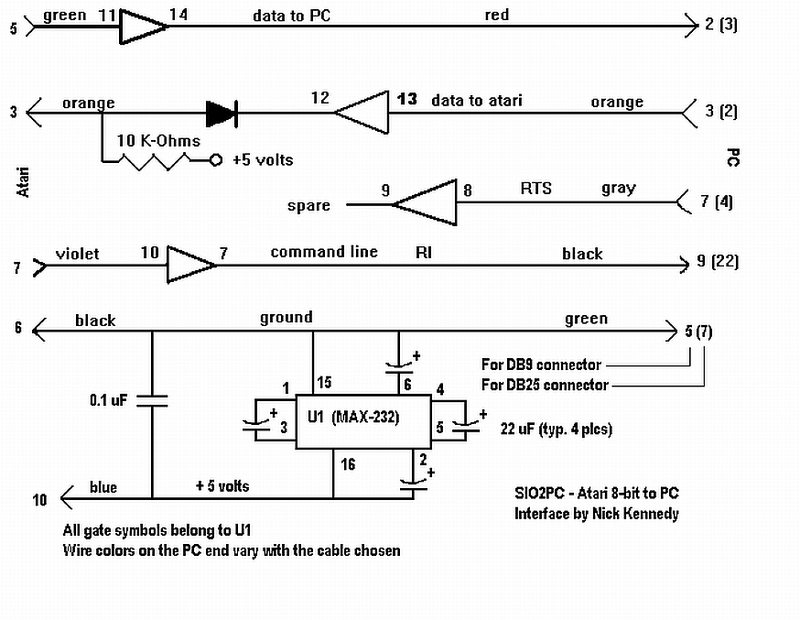 ok, so I modified the SIO2pc cable I have to use CTS.. and we are working with RespeQt no problems. Thanks Hias for figuring that out!! today I was still wondering why this modern software wouldn't work with my original Nick Kennedy cable. Last time I used it I also had to switch to handshake:None. But I double checked my soldering skills, RI Signal was OK. Your software is sure also OK, thats what I assumed being in service for quite a while and used by many users. So I thought it must be PC serial interface related, Maybe some poor RS232 hardware on my system? Didn't suspect Windows though.